This is the best-sounding Google Assistant-powered smart speaker. JBL’s Link View is the best-sounding, display-equipped, Google Assistant-powered smart speaker today. But who knows how long it will hold that title? Google surprised everyone at CES last January when it announced partnerships with various companies, including computer builder Lenovo and home-audio stalwart JBL, to build Google Assistant-powered smart speakers with touchscreens. Lenovo, a company with no real experience building home audio gear, came to market first with the Lenovo Smart Display (we reviewed the 10-inch model and liked it—a lot). The JBL Link View is even better—at least from an audio perspective. The JBL Link View competes more directly with the 8-inch Lenovo Smart Display, which Lenovo was kind enough to loan for a look-see. It should come as no surprise that the biggest difference between the two speakers is that JBL provides true stereo drivers and a 5-inch, rear-mounted passive radiator that pumps the bass even when the speaker isn’t placed against a wall (the better to bounce sound back toward you). Lenovo uses a single monophonic driver, and while its designers did put two front-mounted passive radiators in the Smart Display, that speaker doesn’t deliver quite the same low-end impact. 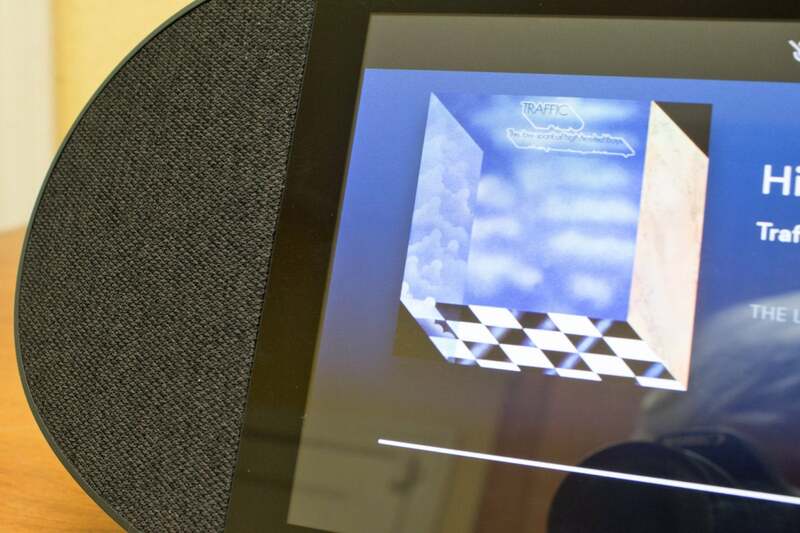 The Link View looks bigger than the 8-inch Lenovo Smart Display, but it has a smaller footprint due to the latter speaker’s asymmetric shape. The Link View’s 5MP camera’s privacy shutter is on top of the enclosure and easy to access, but the button for muting its microphone is somewhat inconveniently located on the back. You’ll need to look over the top of the speaker to find it until you’ve used it enough to locate it by touch. The shutter cover and the membrane volume-control buttons are easy to locate from the front, but you’ll need to peek over the top a few times before you’re comfortable finding the mic-mute switch by touch. There are visual indications on the front of the display for both settings (an orange dot painted on the camera shutter, and a slashed-out microphone icon on the display for the mic). Most people will use voice commands to control the speaker’s volume—and I never had any problem getting Google Assistant’s attention, even while listening to music with the volume pegged—but large membrane buttons for volume up and down are located behind the privacy shutter. I’ll dive deeper into the JBL Link View’s audio performance later. I think most people shopping for a smart speaker with a display will care more about video than audio, so I’ll tackle issue that first. The JBL Link View’s 8-inch touchscreen offers video resolution of 1280 x 800 pixels (pixel density of 189ppi). 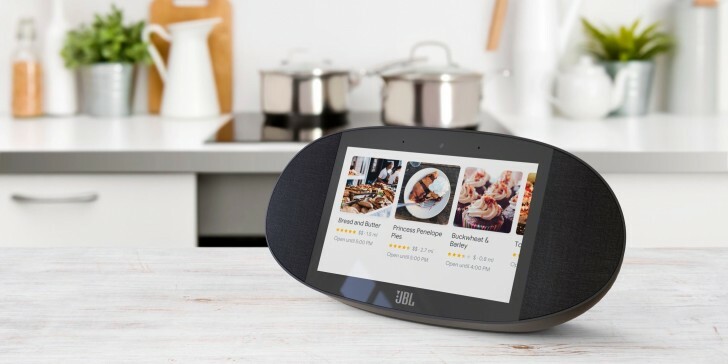 That’s slightly larger and slightly higher-resolution than the 7-inch, 1024×600 (170ppi) screen on the first-generation Echo Show, but JBL doesn’t have a direct competitor for the 10-inch Lenovo Smart Display that sells for the same price as this 8-inch model ($249.99). 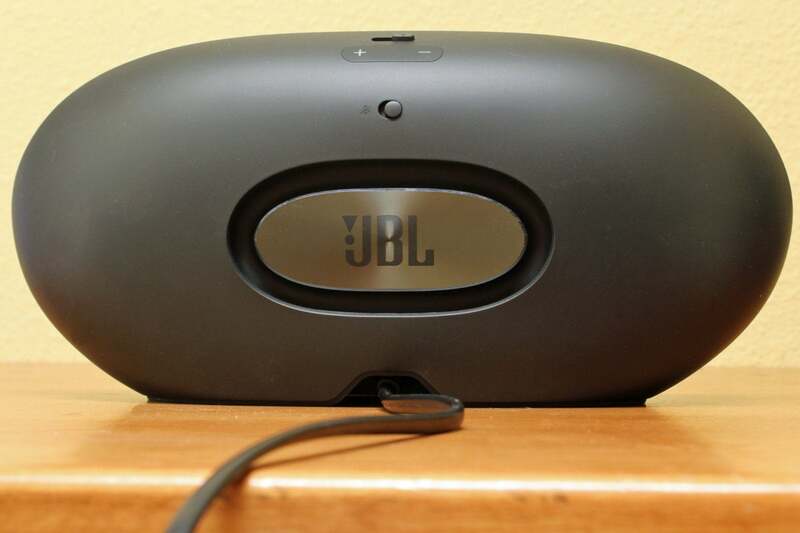 The JBL Link View’s display is bracketed by true stereo speakers. 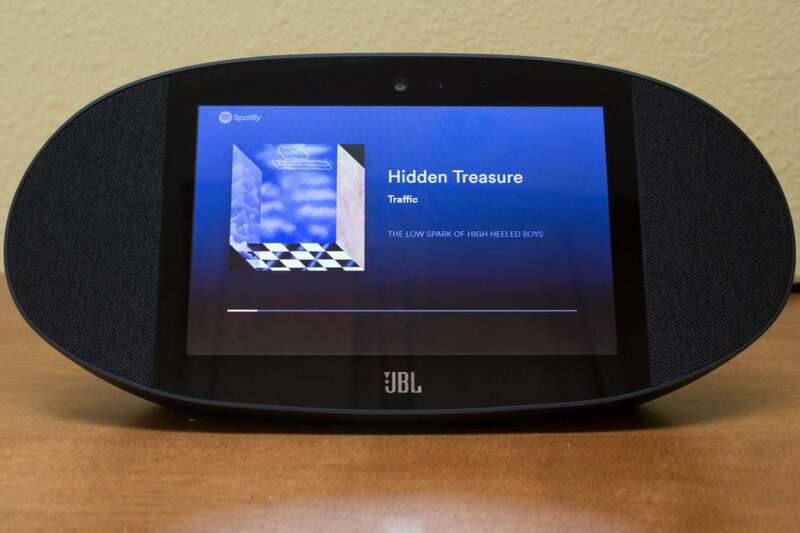 The association with Google gives JBL (and every other Google partner) a huge advantage over Amazon’s display-equipped smart speakers in that it can stream video from YouTube. YouTube isn’t the only source of video on the internet, but it is pretty much everyone’s default choice for free entertainment. Hulu recently announced its intention to be the first streaming TV service to be available on the Echo Show, but I can’t imagine it intendd to be exclusive to the Echo platform for long. Personally, I can’t imagine sitting around watching scripted entertainment on a screen that small, but I might be an outlier. You can make video calls on the JBL Link View, but only if the person you’re calling has Google Duo. If they don’t, you’ll be limited to voice calls. Google Assistant’s Broadcast feature works sort of like an in-home intercom system, except that you can’t call one Google smart speaker from another. Instead, everything you say after “Hey Google. Broadcast” will be played on every other Google smart speaker. There is currently no video element to Broadcast. The Drop In feature the Amazon Echo line offers is much better in this regard because it allows for speaker-to-speaker communication, and you can do it with both audio and video (on video-equipped Echos). That 5-inch passive radiator in the back of the enclosure makes all the difference when it comes to reproducing low frequencies. But video is what’s most appealing about display-equipped smart speakers, so I’ll focus on streaming video from security cameras. I found a mixed bag on that score. As you’d expect, Nest security cameras and the Nest Hello video doorbell work, although I don’t have any of those cameras to test it with. I was able to evaluate it with the Netatmo Presencesecurity camera/floodlight, and it worked great. But you can’t stream video from (the now Amazon-owned) Ring security cameras or doorbells. Google says Arlo security cameras are compatible, but I was unable to get the feature to work with the Arlo Go, which is the only Arlo camera I have on hand. And in case you were wondering, display-equipped smart speakers don’t operate like smartphones or tablets. They have touchscreens, but you can’t install the same types of apps on them. Death to wall warts! 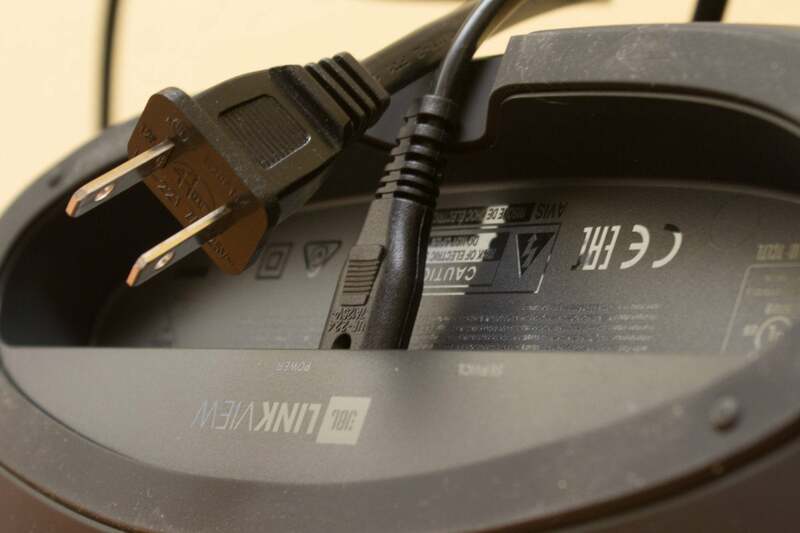 It’s great to see a normal plug on a smart speaker instead of an AC adapter at the end of the cord. Here’s an important caveat for anyone thinking of joining multiple JBL Link View speakers into a multi-room audio system: You can’t—at least not today (despite what JBL’s press release says). You can’t combine the JBL Link View with other JBL Link speakers, either. That’s because the JBL Link View is a Chromecast video device, and Google currently does not allow Chromecast video devices to be grouped. You can’t group Chromecast video devices with Chromecast audio devices, either. That’s a bummer, and Google reportedly intends to do something about it, but it’s not a limitation you’ll face with Amazon Echos—models with and without displays. 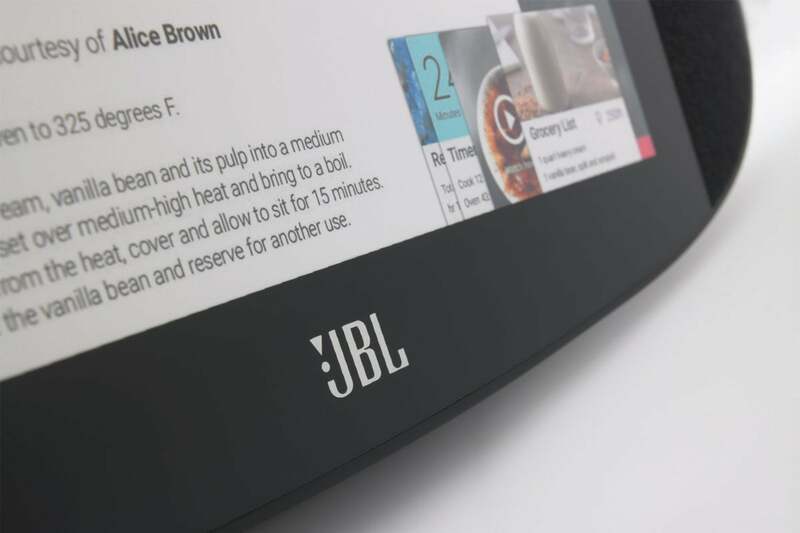 JBL says an over-the-air firmware update will remedy this situation early next year. Apart from audio performance, there isn’t a lot that separates the JBL Link View from the Lenovo Smart Display. If you’re buying a display-equipped smart speaker mostly for music, JBL’s product is the clear winner. The difference in bass response alone is palpable—and not just with rock music. The speaker delivered the opening kick drum and bass on Talking Heads’ “Psycho Killer” (the remastered 2005 version) with a soul-satisfying thud, but I also found JBL’s speaker more enjoyable for listening to acoustic tracks, such as “Dilemma,” by The Modern Jazz Quartet, and Sarah Vaughn’s cover of “Black Coffee.” Neither speaker delivers what I’d consider an audiophile performance, but the JBL is much more exciting than the Lenovo. A Class D amplifier in the JBL Link View feeds 10 watts per channel RMS to a pair of 2.0-inch paper cone full-range drivers. An onboard DSP helps shape the sound to get the most out of the amp, the drivers, and the ABS plastic enclosure. The speaker supports Google Chromecast audio streaming at up to 24-bit resolution, with sampling rates up to 96kHz, and it can decode all the audio codecs that standard supports, including AAC, FLAC, MP3, and WAV. You can stream music from many of the major services, including Spotify, Pandora, Deezer, and of course YouTube Music and Google Play Music (but not Amazon Music). JBL fans will like the sound of the JBL Link View. Better than the Lenovo Smart Display? If you’ve already made your platform decision—Google Assistant versus Amazon Alexa—and you want a smart speaker with a display, your current choices are the JBL Link View or the Lenovo Smart Display. If audio quality is your next priority, JBL has the better product. You’ll get stereo, but you’ll pay more for less display (Lenovo’s 8-inch model costs $199.99 at Best Buy). Apart from that, Lenovo’s prettier industrial design, and that speaker’s ability to operate in portrait mode for video calls, the two products are pretty much identical. Not being able to use any of these speakers in a multi-room configuration with other Chromecast speakers won’t matter to some, but it will be a show-stopper for others. I’d say that the same goes for the inability for this class of smart speaker to serve as a smart home hub, but I think most people who are serious about the smart home are buying something else and integrating a discrete smart speaker into their system.